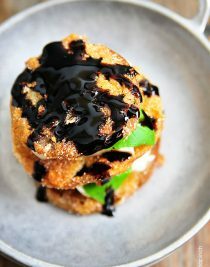 Fried Green Tomatoes are a Southern delicacy and really shine in these Fried Green Tomatoes Caprese Stacks. 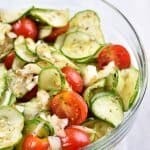 Perfect for easy, elegant entertaining or as a weeknight side dish. 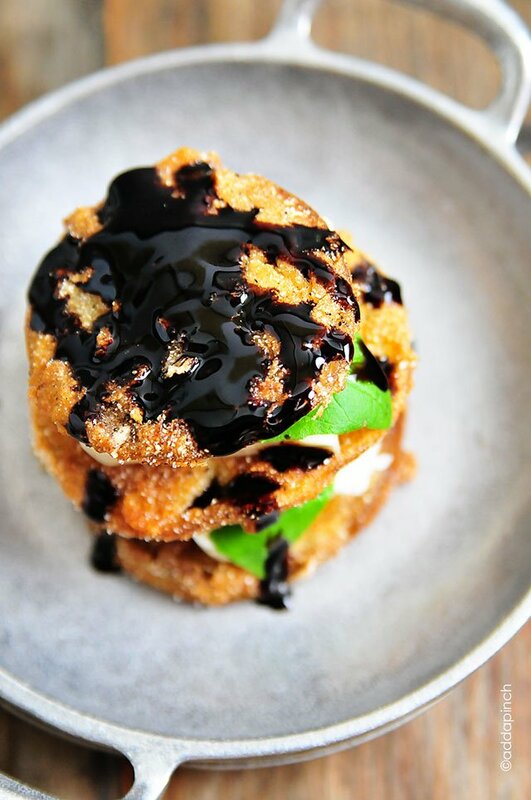 These Fried Green Tomatoes Caprese Stacks are perfect for this time of year. The green tomatoes are bountiful at the farmers’ market or in the garden and if you are like me, they are just as loved as the red juicy ones I’m beginning to see. Fried green tomatoes are what I would call a delicacy in the south, good ones at least, and make a revered appetizer or side dish that I just love. You’ll find them everywhere from family supper tables to menus of many of the nicest restaurants south of the Mason-Dixon line. I have a special love for them and you all know how much I love anything caprese. 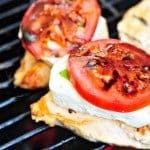 Remember the grilled caprese chicken? If you haven’t tried it, you really should! It is fabulous! Anyway, I knew you’d most likely love this gorgeous fried green tomatoes caprese stacks recipe, too. And just like a plate of fried green tomatoes, it is a welcome appetizer or side dish. 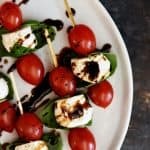 Think about serving it the next time you have guests over this summer. It definitely fits my description of easy, elegant entertaining! 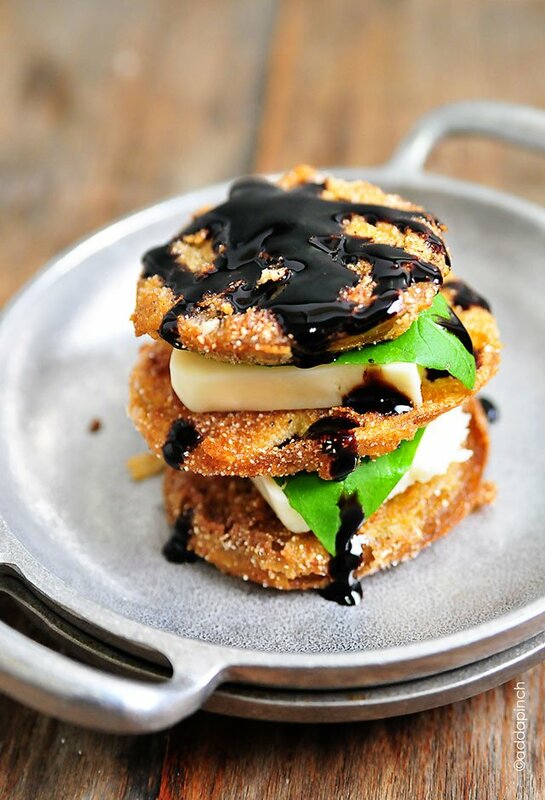 Here’s my Fried Green Tomatoes Caprese Stacks Recipe. I can’t wait to hear how you love it! Fry green tomatoes as instructed in recipe. 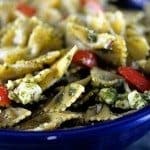 Cut cheese into 8 individual pieces. 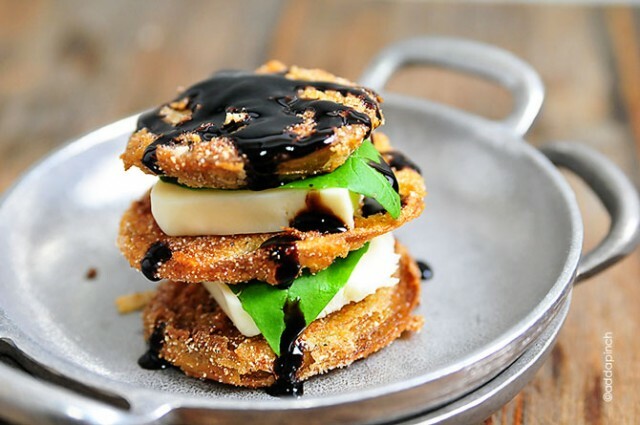 Assemble fried green tomatoes caprese stacks by placing one fried green tomato on a plate. Top the tomato with a piece of Mozzarella cheese, then with a basil leaf, then with another fried green tomato. Repeat with another piece of cheese, another basil leaf and top with a final fried green tomato. 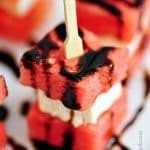 Drizzle top with balsamic glaze. You had at caprese! These look insane and totally delicious! Gosh I just lave summer and aprese anything! The balsamic glaze looks so rich! Oh, ROBYN!!! I couldn’t be more in love with these!!! Absolutely gorgeous! I had fried green tomatoes for the first time last month in Atlanta, and let me tell you.. they were delicious! Wanting to try to make my own.. thanks! I’ll preface this with I’ve never had fried green tomatoes. Sad, I know. But this salad is beautiful, and makes me want some! What a fantastic caprese, love it! I am so excited to meet you next week, yay!!! Oh my gosh…this is just genius! LOVE fried green tomatoes! I’ve always wanted to try a fried green tomato! This sounds awesome! Oh gosh! 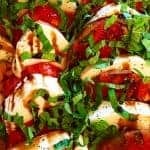 I love fried tomatoes, this recipe is fantastic!